“A220 FAMLY” boasted the Airbus stand’s cabin mockup on day 1 of the APEX EXPO in Boston, with a rather prominent “I” missing. By the next day, someone had taken a marker to the stand, filling the gap between the letters. Harder to add back in was visible innovation on the passenger experience front for the former C Series, which has hardly changed since it was on stands with Bombardier signs on them in previous years. 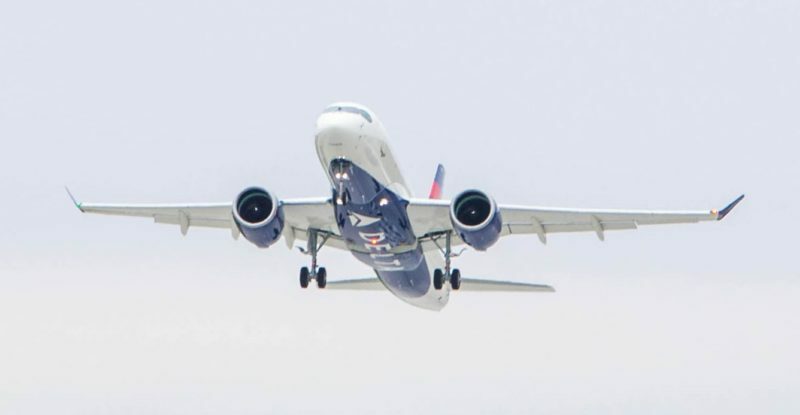 With 2019 shaping up to be the year of the middle-of-the-market airplane, Airbus has yet to reveal precisely how the A220 fits into the picture it has been drawing with the A321neo, A321LR and A320neo, particularly given the lack of market response to the A319neo. In passenger experience terms, the C Series was already a strong contender, nearly winning a Crystal Cabin Award when up against Qatar Airways’ Qsuite and United Airlines’ Polaris products. 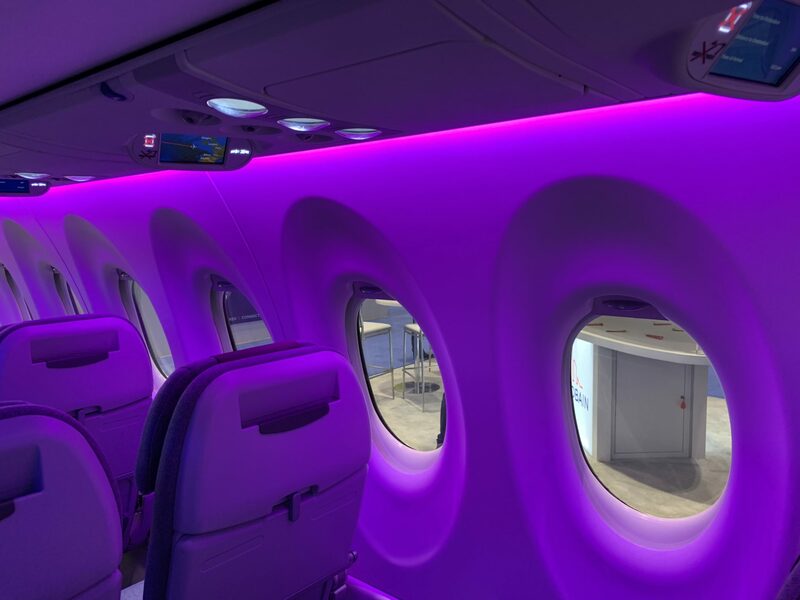 The question for this passenger experience season was to determine how the A220 fit into the A320 context, ironically enough given that the aircraft that spurred Airbus to redesign the A320neo cabin with the narrowbody implementation of Airspace — and the shift in mentality at the airframer to do so should not be underestimated — is now under the same proverbial corporate roof. 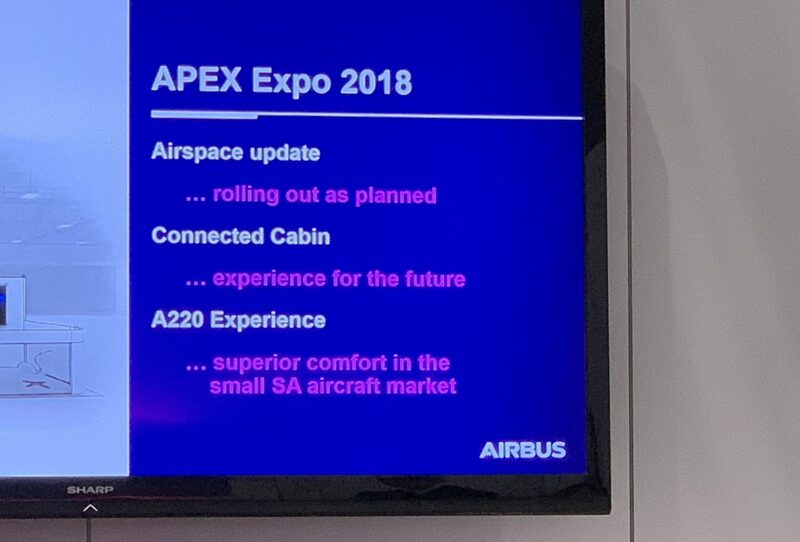 At the EXPO, Airbus was certainly putting the case forward that the A220 fits into the Airspace family of cabin interiors. 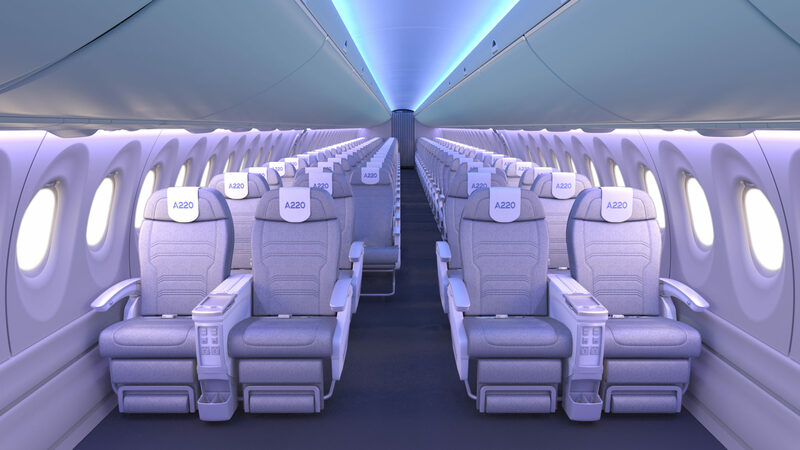 “Visitors to the A220 mock-up will experience the aircraft’s passenger-pleasing features including wide seats and aisle, high-capacity overhead baggage stowage and large windows,” said Airbus’ media messaging at the show, but on the ground it was really just a few rows of the same Zodiac seats in the same PaxEx-positive cross-section with the same bins and the same big windows that are familiar to observers. What seems particularly missing in the A220 is premium seating beyond a 2-2 recliner option, which for the cross-section would be quite a narrow set of seats: thinner than the 2-2 on a DC-9/MD-80/Boeing 717 cross-section, and quite a bit thinner than a 737’s 2-2 or Embraer E-Jet’s 1-2 layout. 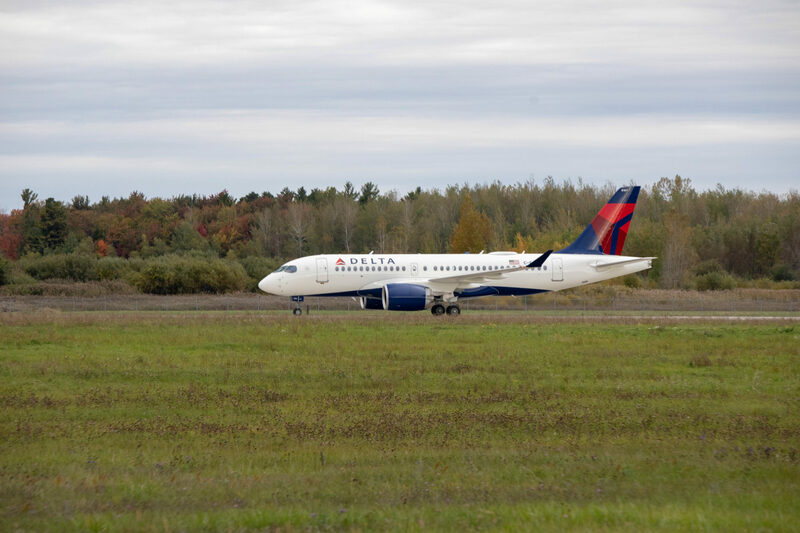 Delta’s first A220, the first to be delivered with any premium seating beyond Eurobusiness, took its first flight this week. With Embraer’s thought-provoking staggered seating layout on the E2 generation of E-Jet, the premium question feels very much like an obvious one to answer. Indeed, it’s an open question for customers like jetBlue and David Neeleman’s new baby (which we’ll call Moxy, although that won’t be the name), which may well be interested in playing with the range numbers for a lighter, more premium-focussed CS300: the “Junior Mint” that jetBlue has already stated it is considering. Looking more widely, it would be understandable if the answer to this question were part of a formal strategy: a sort of “if you want a premium cabin on this size aircraft, you probably want an A320neo or, at a pinch, an A319neo” message. Given the replacement by chief commercial officer Christian Scherer of Eric Schulz after less than a year, and indeed in the transition at the top of the Airbus group and its commercial division, it would be no great surprise if the messaging still requires further decision-making. One key element will be what supplier lock-in remains as a holdover from the C Series to the A220. RGN understands that the Zodiac Aerospace — originally via the California-based C&D Zodiac, with Zodiac now itself part of wider conglomerate Safran after the latest round of industry consolidation — has substantial exclusivity which may well restrict the options available. An Airbus-Safran set of negotiations will naturally be a different landscape than a Bombardier-Zodiac one, and may unlock further options. Airbus may well have wanted a full year cycle of “same aircraft, different sales team” for the C Series-to-A220 transition. 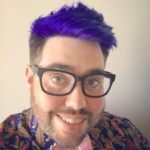 But there will come a point fairly soon where the questions about exactly what prospective customers can put inside the aircraft will become impossible to ignore. Given that the cabin width (and height) of the A220 is actually greater than the Douglas/Boeing cabin cross-section (DC-9/MD-80/B717 cabin maximum width is around 314 cm; vs C Series/A220 cabin maximum width of around 328cm), how does that translate into the A220 being limited to having narrower ‘2-2’ seats versus the DC9/MD-80/717?